OTTAWA – A Canadian woman rushed to hospital on New Year’s Eve for what she believed was a kidney stone gave birth to a baby boy instead, local media said on Thursday. Juanita Stead, 36, said she did not suffer morning sickness or put on extra weight during her pregnancy, and continued to menstruate and so she had no idea that she was pregnant. A hospital X-ray on New Year’s Eve for back pains revealed the truth. “The technician looked at me and said, ‘My dear, you’re pregnant with a full-term baby.’ And I said: ‘No sir, you got the wrong woman and you’re looking at the wrong screen. There is no way I’m pregnant,” she said. Nicholas was born soon afterwards. Coincidentally, the birth of the couple’s first child, two-year-old Cameron, also caught them off guard. 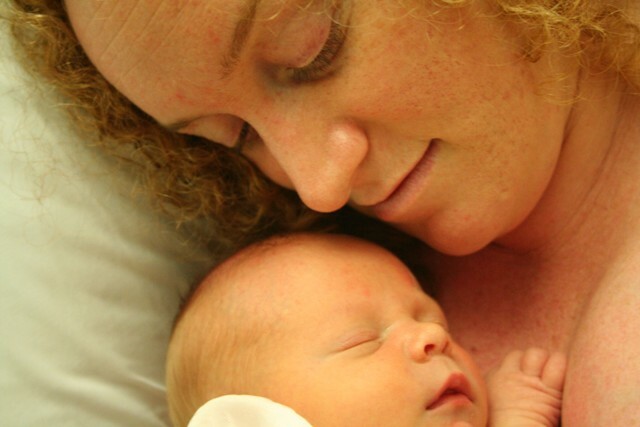 Stead knew she was pregnant with Cameron, she said, but he arrived two months early. “I felt like I had to go to the bathroom and out he popped, right into the toilet,” she said. Her husband scooped their first-born out the toilet and put him in his mother’s lap until an ambulance arrived, she said. Not knowing you’re pregnant and thinking you just have random back pain. And Speck, I guess I can’t be sure that this one won’t happen. But I will take precautions. Like if I get discomfort close to the due date that is persistent perhaps I’ll just pee on a towel or something just in case? Really though. Crazy. Overall, while your father is Canadian and from the looks of this article this does leave you at a great disadvantage to the rest of the world’s population, I trust that my genes will pull you through! Don’t fear!! ps. enjoy the baclava. I went to Auburn especially for you to get some good stuff….. (it really was for you, I could almost hear your voice asking for some)..
My girlfriend’s cousin only found out she was pregnant when she was 7 months along. They had to quickly re-locate back to Australia from New York (no health insurance!) and quickly prepare for bub’s arrival. Amazing. She had her period the whole time. now now. stop the canuck bashing now or I will start looking for strange Aussie news, and you know that will get ugly. oh my goodness. crazy… Did she think she was putting on weight unexpectedly around the belly? ?